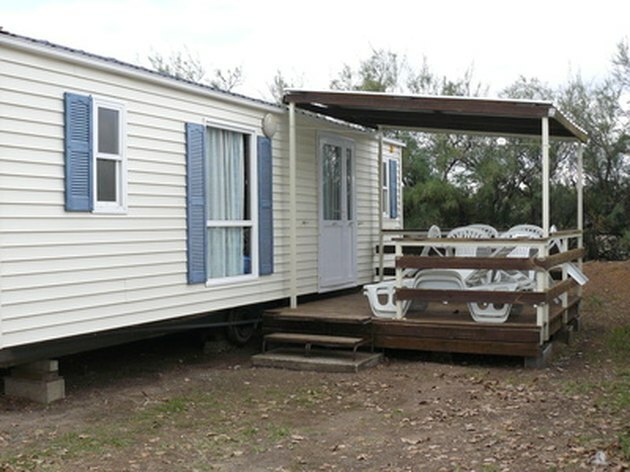 The construction of a mobile home or double-wide takes place on an assembly line. Typically, vinyl flooring is rolled across the entire floor followed by carpeting. Workers build the walls atop the carpeting. They cut the carpet away in rooms where vinyl flooring is intended. Wallboard -- a form of drywall with a pre-printed pattern -- is attached to the 2-by-4s in mobile homes with staples to form the walls. Mobile home walls are made of wallboard. Pry the moulding loose from around the ceiling. Be very gentle if you plan to re-use it. Mark the moulding's location on the back with a marker, even if you are purchasing new moulding. This will provide a template for the pieces. Pull all the nails out of the wall and out of the moulding. If they are bent, dispose of them. You can re-use those that are in good condition. Detach and keep the vertical corner moulding. Remove any horizontal decorative or chair moulding. Pry loose the floor moulding. Again be very gentle as it is fragile and can be expensive to replace. Mark its location on the back. Remove all the nails. Detach the first piece of seam strip. If you plan to re-use it, be very gentle. It's very difficult to remove it without breaking it because it's so fragile. You may be able to save most of them. They should all be the same size, so there is no need to mark them. Remove the first piece of wallboard. Try to remove it in one piece if it is anything but a straight cut. If you can do so, you can use it as a template to cut your new piece. Replace all the panels in the room. Use drywall nails for drywall. For wallboard, use fine nails or staples. Patch any defects in the drywall with putty if necessary. Sand it once it's dry. Paint it or hang your wallpaper. If you chose wallboard, hang your old or new seam strips. Retrieve the ceiling moulding and nail it back up in the proper order using finishing nails. 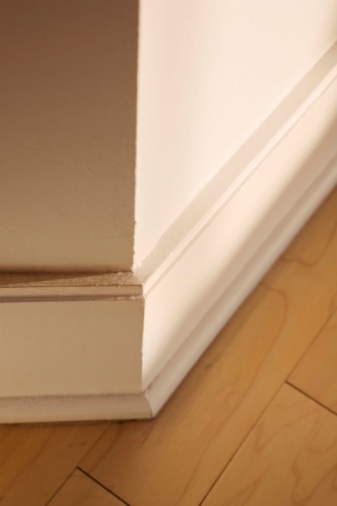 Nail the floor moulding in place using finishing nails.